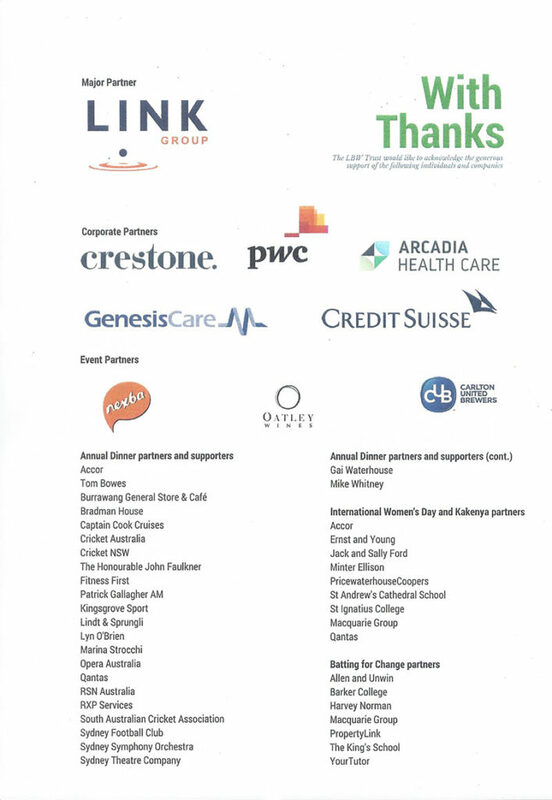 The Learning For a Better World Trust was founded by Peter Roebuck in 2006, with the invaluable assistance of Peter Strain, Darshak Mehta, and Mike Coward. The aim of the trust is to create better learning opportunities for young men and women in the developing world. 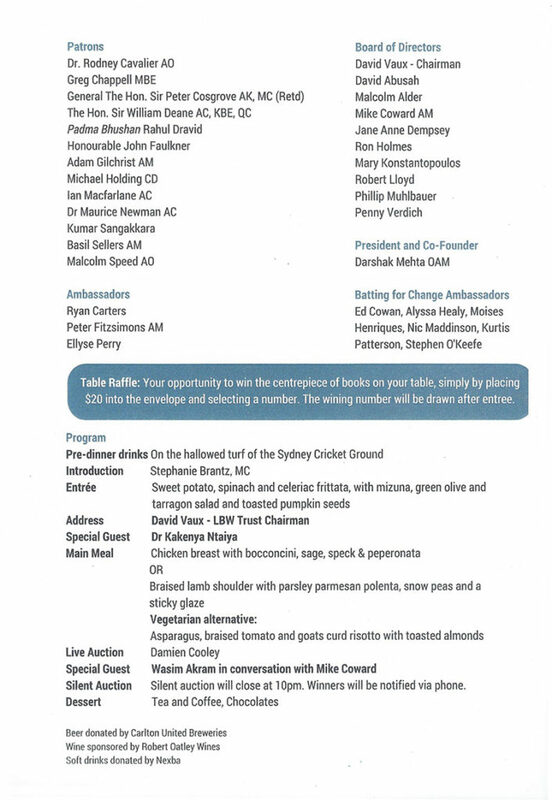 It is funded by the Australian and the international cricketing community. 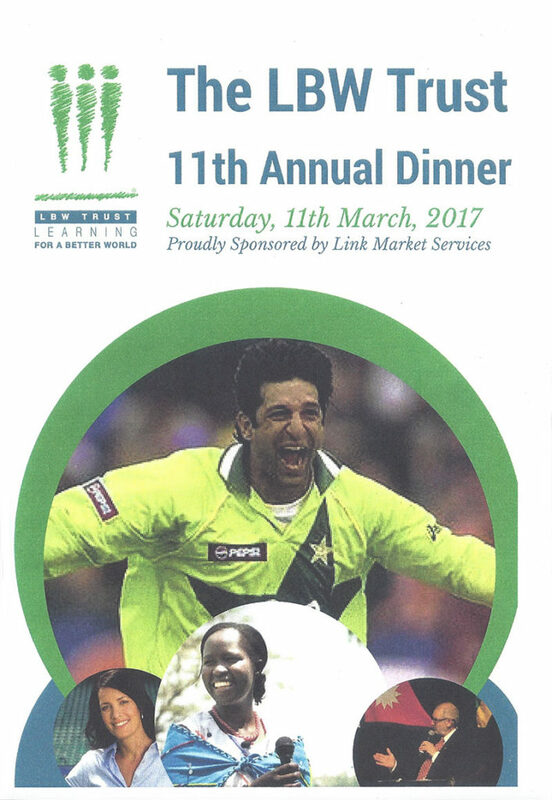 On Saturday, 11th March 2017 the LBW Trust held its 11th annual dinner. Below is a transcript of the President’s speech and the booklet published for the event. 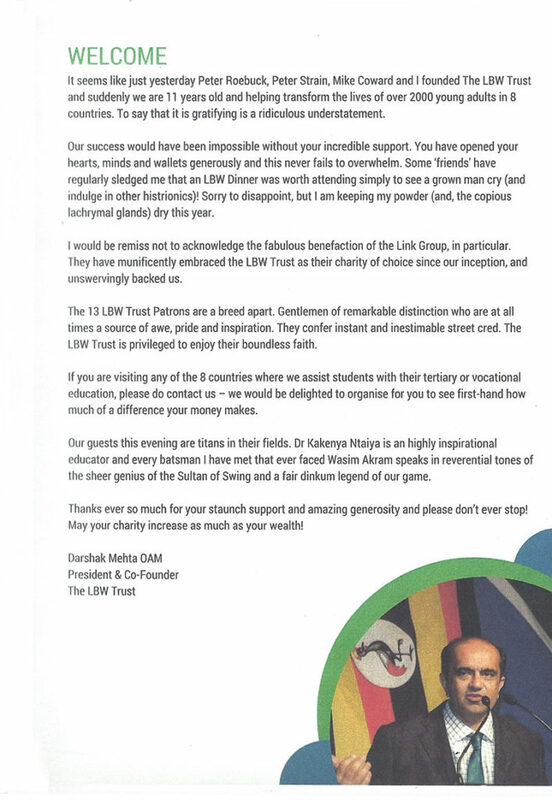 It seems like just yesterday Peter Roebuck, Peter Strain, Mike Coward and I founded The LBW Trust and suddenly we are 11 years’ old and helping transform the lives of over 2,000 young adults in eight countries. To say that it is gratifying is a ridiculous understatement. Our success would have been impossible without your incredible support. You have opened your hearts, minds and wallets generously and this never fails to overwhelm. Some ‘friends’ have regularly sledged me that an LBW Dinner was worth attending simply to see a grown man cry (and indulge in other histrionics)! Sorry to disappoint, but I am keeping my powder (and, the copious lachrymal glands) dry this year. I would be remiss not to acknowledge the fabulous benefaction of the Link Group, in particular. They have munificently embraced the LBW Trust as their charity of choice since our inception, and unswervingly backed us. The 13 LBW Trust Patrons are a breed apart. Gentlemen of remarkable distinction who are at all times a source of awe, pride and inspiration. They confer instant and inestimable street cred. The LBW Trust is privileged to enjoy their boundless faith. If you are visiting any of the eight countries where we assist students with their tertiary or vocational education, please do contact us – we would be delighted to organise for you to see first-hand how much of a difference your money makes. Our guests this evening are titans in their fields. Dr Kakenya Ntaiya is an highly inspirational educator and every batsman I have met that ever faced Wasim Akram speaks in reverential tones of the sheer genius of the Sultan of Swing and a fair dinkum legend of our game. Thanks ever so much for your staunch support and amazing generosity and please don’t ever stop! May your charity increase as much as your wealth!